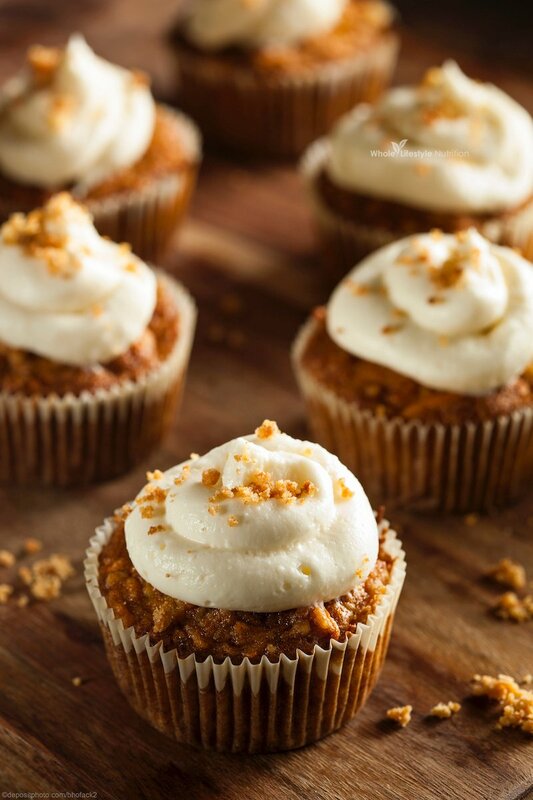 Yay, bet you just want to sink your teeth into one of these amazing carrot cake cupcakes, don’t you? It’s okay. 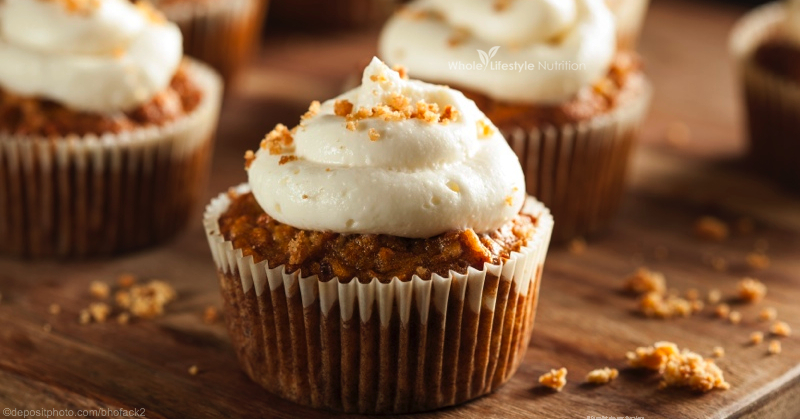 These little gems are definitely a healthier version of a carrot cake cupcake. They are gluten free, grain free and loaded with healthy ingredients! So indulge a bit, enjoy because carrots have never tasted so good! I mean, really. Look at these! So I am so happy to share this recipe. This recipe is adapted from one of my very first readers: Val Basset! She reached out to me a few years ago with this amazing recipe! Now when we have a party or BBQ, you can bet your last dollar that I am taking these every. Single. Time! And EVERYONE always asks me for my gluten free and grain free carrot cake cupcake recipe and I happily give it out! This is so much more than “just a cookbook”! 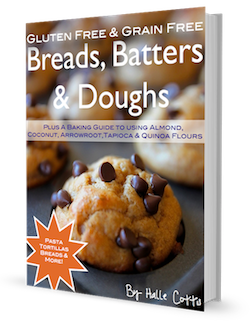 In this book, I teach you how to bake with almond flour, nut butter, coconut flour, tapioca flour, arrowroot flour and even toasted quinoa flour! You will be an expert in gluten free and grain free baking after you read this cookbook, I promise! There are tons of gluten free, grain free and Paleo recipes throughout this book! Get your copy today!! Let’s Make These Things Already! 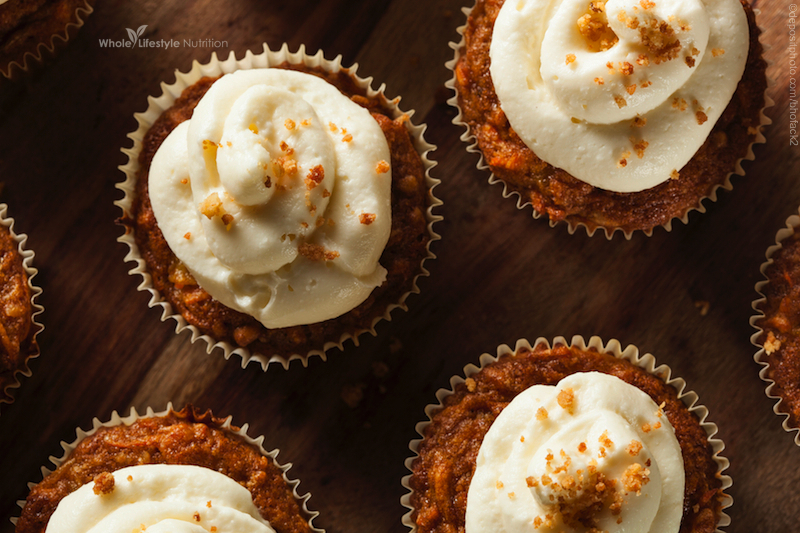 Here is an amazing gluten free and grain free carrot cake cupcake recipe that everyone will enjoy! Combine all ingredients and put in greased muffin pan 2/3 full. Note, if you want the muffins big, you might only need to fill 8 muffins 2/3 full. Bake for 18-24 minutes. Insert a toothpick, when it comes out clean it is done. For frosting combine cream cheese, vanilla, honey and salt and 3 tbsp of water and whip on high speed for 3 minutes. This will create a fluffy and smooth frosting. 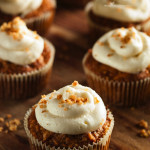 You can put the frosting into a small plastic bag and cut the tip of a corner off and pipe it onto a cooled carrot cake cupcake. Thanks for the recipe. I look forward to trying this out. Although the recipe calls for honey, can I use grade B maple syrup instead and use the same quantity? Thank you. Sure can, and you can use the same amount too! Yes, you can double this recipe without any issues. Enjoy! You are missing measurements for the raisins and chopped walnuts. What is the quantity? Great question! I would say no more than 1/2 cup of raisins and just maybe 1/4 cup of chopped nuts if you are using walnuts too! I really like this recipe a lot. All the ingredients are exactly what I’ve been looking for in carrot cake. Would I be able to make this as a cake too? I think it would work as a cake as well, but I have not tried it yet. I tripled the recipe and baked a two layer cake. That sounds great Char! I’ll have to give that a try, thanks for sharing! I have made these cupcakes several times and want to tell you we love them!! Great recipe! Tonight we are going to try making a cake with the recipe! Thank you for sharing!! How was the cake, did you change the amounts any? I would like to make these. I’m just wondering if there is a typo. Just 1/4 cup coconut flour???? Nope, the amount is correct. Coconut flour is VERY absorbent and 1/4 cup is all you need. Recipe looks good. Just wondering if 1 TBSP of vanilla is too much. Thanks. It seems like a lot, but it taste so amazing! 🙂 You can back it down a bit, but I love vanilla and I did not feel it was too much. HI, I was just wondering if you could use gluten free self raising flour instead? And the amount you would need. For some reason, I ended up ended up with making 12 mini cupcakes because the portion wasn’t enough for regular 12 cupcakes. Did I Not get the measurements correctly? I ended up with the same thing–12 mini cupcakes. If I had tried to spread this into 12 regular cupcakes, they would have been very thin. I don’t really mind since they are DELICIOUS (and healthy–yay! ), but I was wondering if I did something wrong, too. Also, has anyone tried this as a cake? I want to make it for a birthday party, and I’m wondering how it would hold up. Can I substitute the coconut flour with almond flour & if so what quantity of almond flour must I use??? Unfortunately, they do not substitute in this recipe. If you do try to use almond flour, you will probably need at least double the amount, maybe more. Can I substitute rice malt syrup for the honey? I’ve never tried this, but it seems like it would be a good substitute. I did everything according to the recipe except one thing- substituting molasses for the honey. I have doubled the amount of ingredients to make double the amount of cupcakes. They did not rise and were very soft.the dough was on the liquid side like. Is that how it suppose to be or I missed something? Thank you! Did you use coconut flour? Sounds like you might need a little more. All coconut flour is different so you might want to try a different brand. Awesome recipe, the cupcakes taste great!